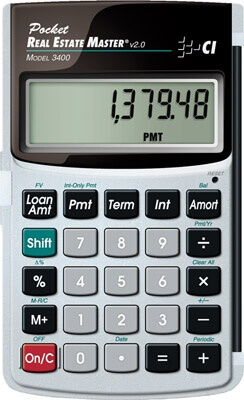 Need an easy-to-use, inexpensive pocket-size loan calculator for instant mortgage solutions? The Pocket Real Estate Master helps you easily compare loan options. Find a monthly payment based on different loan amounts or interest rates. Find a loan amount based on a payment your client can afford. Quickly determine the total interest and payments paid and the future value of a home. For real estate and financing professionals, home buyers and anyone interested in mortgage financing.